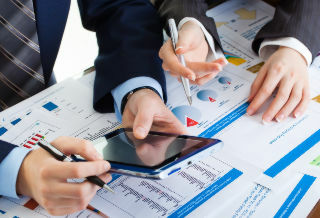 The Market Makers and the Liquidity Providers are the BVB participants that support the liquidity on the financial instruments on which they are registered, by placing buy and sell firm offers during a certain period of the Continuous trading (Open stage of the market), under specific quoting terms (minimum volume and maximum spread). This activity is carried out based on the agreement between such participant and BVB, according to the specific of the financial instrument. Also, an economic incentive is granted to them for providing liquidity. The Market Making activity for shares contributes to the improvement of the market’s liquidity for the shares on which they are registered, as well as to enhance the quality of the market for the investors. The program developed by BVB for the Market Makers registered for shares traded on the BVB’s regulated market intends to provide a better efficiency and to bring the benefits on the market structure in terms of Market Makers’ affirmative involvement, better conditions for competitive quoting, price improvement and liquidity. This program has brought two types of the Market Makers available: Classical Market Maker and Super Market Maker, with specific affirmative quoting implications, as well as with a dedicated incentive fee scheme applied to them, that are significantly lower compared with the usual trading fees. 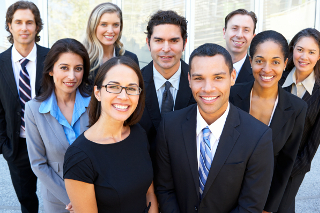 In addition, a dedicated program is built in order to reward a greater involvement of them for the shares registered, based on the specific terms applied. 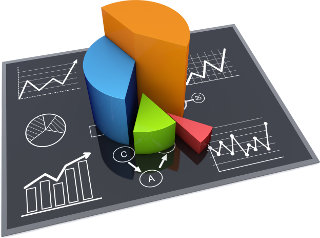 This new Market Making program has a Day Trading component that will be applied only for the retail clients of the Market Makers on the shares on which they are registered and it consists in providing an intraday rebate to the trades carried out intraday by the respective clients, according to the particular terms of the program. The liquidity providing activity can be considered as a dedicated business line by the BVB Participants, which represents a trade-off between their more active involvement in the market and the benefit granted in terms of the discounted trading fees applied to them. BVB attaches a great attention to the activity of Market Makers and appreciates the involvement of the current Market Makers in the program as the participants which contribute to the bettering market conditions of the shares considered. Also, BVB is eager to provide full support for any other participant interested to be implied in this program. 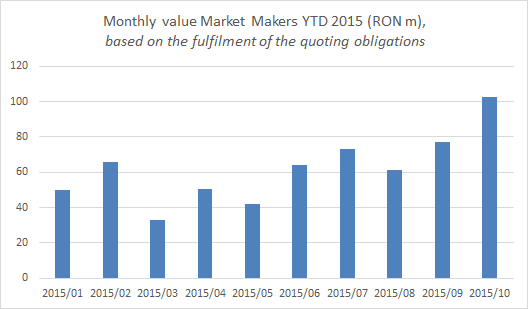 The total monthly traded value registered by the Market Makers in October 2015 was the highest monthly value registered YTD 2015, of RON 102.61 m, meaning an increase of 33.25% compared to September 2015. Moreover, it represents 10.43% in the average of the total monthly traded value with the shares included in the market making program, the highest percentage YTD 2015. 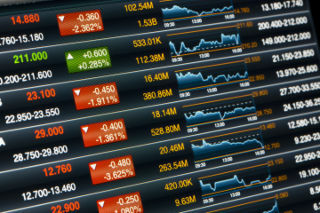 Bucharest Stock Exchange publishes, starting March 2013, the monthly Market Makers (MM) and Liquidity Providers (LP) quoting performance for the financial instruments admitted to trading on the Spot Regulated Market for which they are recorded. The quoting performance is computed and published, usually, in the first 10 trading days of the current month for the previous month. 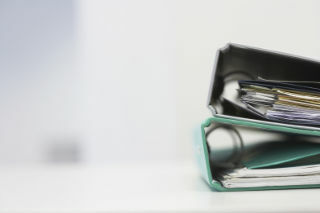 Notes The monthly average performance is published for informative purposes; it does not represent the exact fulfillment of the daily obligations assumed by the MM and LP.